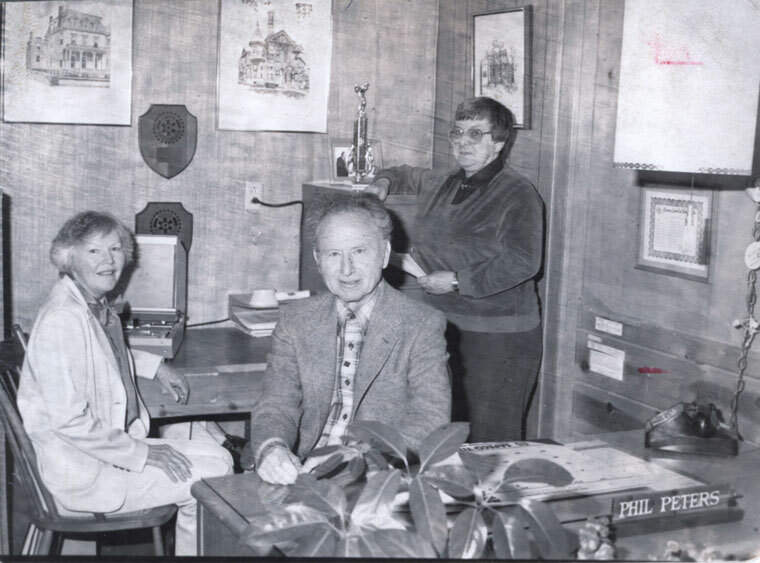 Idyllwild Realty in the Alpine Pantry building in the early 1980s included (from left) realtors Ruth Margaret and Phil Peters and Realtor Association Janetta Landry. “Ma’s New Husband,” the first production of the Mountain Players, was a big hit. Evie Kretsinger and Leigh Dutton headed the cast. Boxes were placed in village stores for gifts of food and clothing for American Indians on the Santa Rosa reservation. Businesses were asked to enter the Community Yule Decoration Contest the Idyllwild Chamber of Commerce sponsored. Intermittent rain fell, bringing the season’s total to 10.90 inches, compared to 1.87 inches for the previous year. Welch’s Carriage Inn offered a complete dinner for $1 on Wednesday Family Night. With grocery industry strikes affecting deliveries to the Hill, local grocery store owners were making runs to Los Angeles and Santa Fe Springs several times a week to obtain goods. Busted water pipes, hard-to-start cars and cold hands tormented many Hill residents when a cold spell dropped temperatures to as low as 8 degrees. Hemet Unified School District announced it was exploring yet another prospective site for a mountain high school. Funds were approved to complete an environmental assessment on the site located behind the Living Free Animal Sanctuary in Mountain Center. After serving two years on the Hemet Unified School District board, Bill Sanborn was elected president. Mike Pearson, a good friend of Santa Claus, was booking Christmas Eve visits by Santa to locals’ homes in exchange for a donation to the Idyllwild Tree Monument maintenance fund. The County Service Area 38 Advisory Council proposed a special tax to be collected from Pine Cove property owners to help fund the Pine Cove Fire Station and ambulance contracts. The tax was to be voted on in May. The defense attorney for accused murderer and arsonist Raymond Lee Oyler had inadvertent support from the federal government for his contention that another more likely person was an arson suspect at the time Oyler was arrested. Within the San Bernardino National Forest, the national fee area review resulted in a proposal to eliminate the standard amenity fee designation for seven areas (Arrowhead, Barton Flats, Big Bear North, Big Bear South, Black Mountain, Falls and Thomas Mountain). SCE turned off electricity in anticipation of high winds for more than 24 hours.